Transfer from airport to a hotel. Visit to the Moscow Kremlin which is a symbol of the Russian State, one of the greatest architectural complexes in the world, a treasure house of magnificent relics and monuments of art. 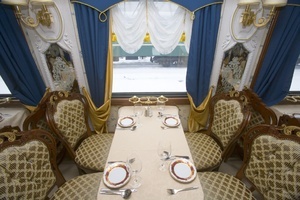 Welcome to the «Imperial Russia» Train. Grand City Tour «Highlights of the Northern Venice» with an inside visit of Kazan Cathedral. Visit to St. Peter&Paul’s Fortress and Cathedral, visit to St. Isaak Cathedral. Tour to Tsarskoe Selo Summer residence. Visit to the Petrovskaya Akvatoria. Tour to the village Kinerma. City Tour with visiting the Museum of the fine arts of Karelia. Sightseeing tour of the city including icebreaker “Lenin”, soldier memorial, sailor memorial and local bridges. Back to the hotel to prepare for New Year Celebration. New Year Dinner and Entertainment program. Tour to Russia Father Frost House (photo with him), dog sled, games and activities. Lunch with Father Frost. New Year City Tour with visiting of Kremlin and its territory. 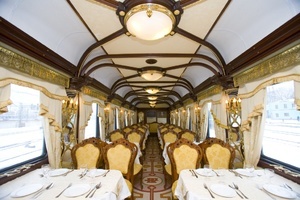 Onboard the “Imperial Russia Train”. 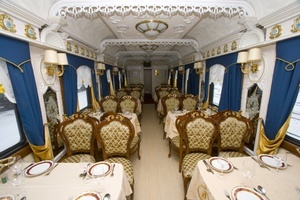 Towels, bathrobe and slippers available onboard of the “Imperial Russia” train. Excursions with local guides according to the program. 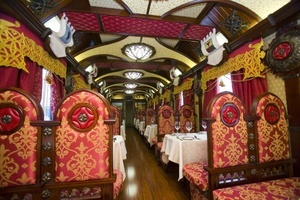 Excursions will be conducted in English, German, French and Spanish. Other languages are possible upon request. Tea/coffee on board throughout the day. Services of the porter at the hotel and the railway station. Brief informative lectures on the Russian New Year and Russian traditions, geography and history of Russia. English Speaking Group Leader and Tour managers. 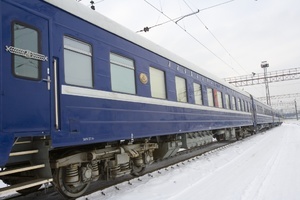 The cost of Russian entry visas (“Russian Railway Tours” is not responsible for passengers who have incorrect or expired visas). 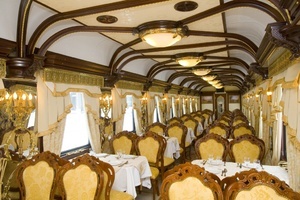 All drinks ordered in the bar car. “Tailor made” excursions. You have possibility to extend your Tour. 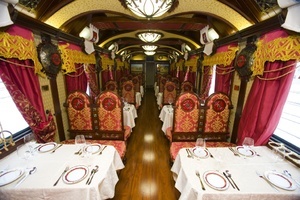 We offer additional excursions in every city within the Tour. Meals on the day of arrival, departure. Vaccination: consult your doctor or medical center for specific health advice, due to visit of different countries in terms of this Tour).